FINALLY! “Fried” rice you’ll love with out the self-loathing! Despite the fact that baked fried rice takes longer than fried fried rice, it’s no longer any further paintings–actually, it’s most probably slightly bit much less. And you find yourself with that highest fried rice texture and style in a more healthy package deal! Baked fried brown rice made with sriracha, pineapple, cashews, and edamame. 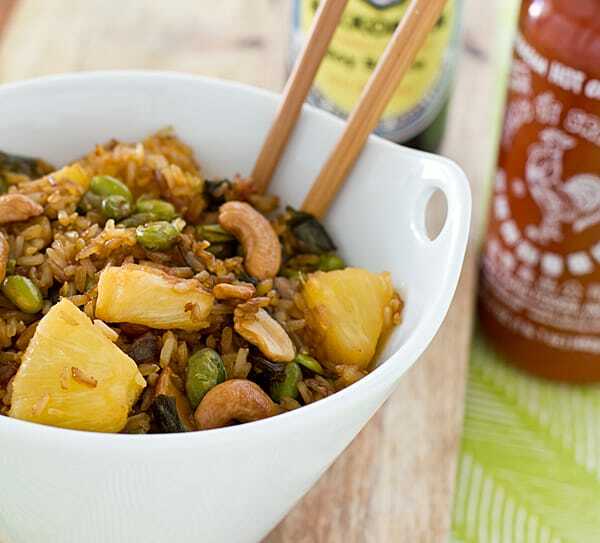 Mix rice, inexperienced onions, pineapple, edamame, and cashews in a big bowl. In a small bowl, whisk in combination oil, soy sauce, and sriracha. Pour oil combination over rice combination and stir till well-combined. Spray a rimmed baking sheet with oil or cooking spray. Pour rice onto sheet in an excellent layer. Bake for 45-60 mins, stirring about each 20 mins, or till rice is dry and simply starting to get crispy. Serve with further soy sauce and sriracha, if desired. The rice I used for this used to be 2 days previous.